Hey, that’s not the video I rented! 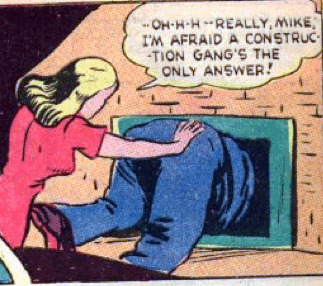 The box didn’t say anything about a construction gang! In breaking news, construction gangs have struck again, this time erecting a small strip mall on the corner of 5th and Elm. The vandals left in their wake a Starbucks, a Sunglass Hut, and a Sbarro. Police are asking for any tips as to the identity of these hammer wielding hoodlums.